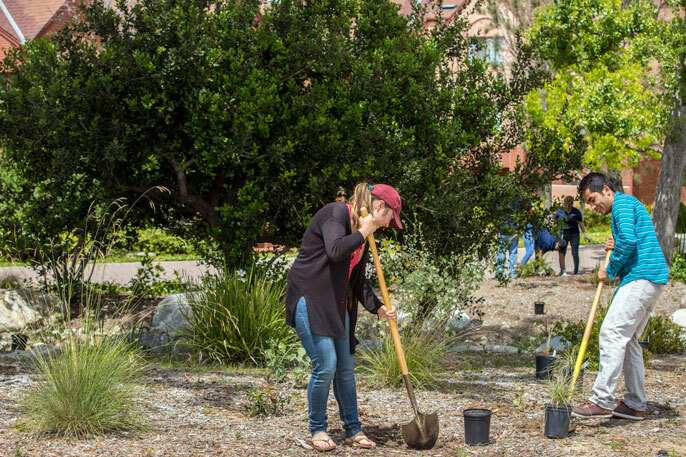 Students plant trees and drought-resistant plants at UC Irvine’s Arroyo Vista housing community. Such sustainability-related activities — along with green energy and ecofriendly transportation programs, water conservation efforts and research — have contributed to the campus’s status as a top 10 “Cool School” for eight consecutive years. Seven UCs are among the top 50 most sustainable universities in the U.S., according to Sierra Magazine’s newly released 2017 “Cool Schools” list. UC Irvine ranked in the top 10 for the eighth consecutive year, an achievement unmatched by any other school. To compile the list, the magazine surveyed 227 schools in the United States and Canada based on the priorities of the Sierra Club (its parent organization), such as campus energy use, transportation, food, water and more. UC Irvine’s innovative energy solutions received particular recognition this year: ‘smart’ labs that have reduced campus energy consumption by 50 percent; the first power-to-gas hydrogen project in the United States; and a zero-emission, hydrogen-fuel-cell bus fleet ready to debut this fall. The magazine also acknowledged a long-standing culture of climate concern and collaboration across the UC system as vital to its success. While UC Irvine is notable for its consistency, UC Merced is impressive for its meteoric rise. The campus broke the top 50 for the first time this year, improving its 2016 position by more than 30 spots. UC Merced is on track to meet its ambitious Triple Zero Commitment — to consume zero net energy and produce zero waste and zero net greenhouse gas emissions by 2020 — and is the only university in the nation to have all of its buildings certified by the U.S. Green Building Council’s Leadership in Energy and Environmental Design (LEED) program. To learn more about the rankings, visit the Sierra magazine announcement here. You can also view the full 2017 Cool Schools list here.